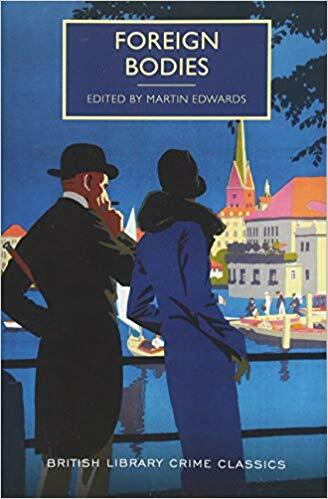 Foreign Bodies edited by Martin Edwards, Poisoned Pen Press 2018 trade paperback, British Library Crime Classics series, mystery short stories. This volume contains fifteen stories, all translated from foreign (non-English speaking) authors from around the world. I was impressed with the concept and ordered the book as soon as I found out about it. Now, having read it, I admit I’m less enthusiastic. I found several of the stories not to my taste at all, and only two of them really enjoyable. This could well be simply a matter of taste, or present mood, but I’m afraid this isn’t an anthology I can recommend. Although you’ve given FOREIGN BODIES a luke-warm review, I have always found Martin Edward’s anthologies well-research, varied, and worthwhile. While each volume may have some clunkers, that’s usually a matter of personal taste. While I have not yet seen the book, I’ll venture that Martin has done a great service to the genre with this latest anthology. Speaking of worthwhile anthologies, I finally finished Otto Penzler’s BIG BOOK OF SHERLOCK HOLMES STORIES. Great stuff, satisfying knowing the game will always be afoot. I still have six or seven of his door-stopper anthologies on hand and will be dipping into them from time to time. In between my short story reading this month, I went back to longer works, reading three very good crime novels: THE DEVIL’S RIGHT HAND by J. D. Rhodes, STAY by Victor Gischler, and Joe R. Lansdale’s latest Hap and Leonard, THE ELEPHANT OF SURPRISE. I also read three graphic novels this week: Brian K. Vaughan’s THE PRIVATE EYE (my FFB this week), Saladin Ahmed’s BLACK BOLT, VOLUME 2: HOME FREE, and Gerard Way’s DOOM PATROL, VOLUME 1: BRICK BY BRICK. May the gods of weather smile upon your garden this week, may your reading be ever worthwhile, and may you and Barbara take it easy but take it. I agree with you on Martin Edwards’ anthologies, Jerry, but found this one to be the exception. Nothing wrong with his editorship, I just didn’t enjoy most of the stories. The J.D. Rhodes interests me, tell me more. Barbara is doing better, but because she insists in overdoing it, her knee is not healing the way it ought. I’m tired of pestering her to no avail. She is getting more reading done, since she doesn’t go to 24-hour Fitness for Zumba several days a week. She’s been catching up on Elizabeth George novels. Rainy here. I am, as you know, also a big fan of Martin Edwards’s anthologies, but I have to agree with you here. FOREIGN BODIES was OK (as I remember it from way back last summer), but not as good as his other collections. Also reading another O. Henry collection (ROADS OF DESTINY), with many other collections (including the new Peter Lovesey from Crippen & Landru) on hand. I must admit that after liking Jane Harper’s first two books, I could just not get interested in the new one (THE LOST MAN) at all. Will have to try again another time, but the extreme Outback setting and the characters did not engage me. Instead I am reading another (first) Aussie mystery that does, Emma Viskic’s RESURRECTION BAY, set (so far) in Melbourne. Caleb Zelic is deaf, a private detective working with a former cop. His best friend is murdered in his home and he has to find who did it. At the same time, I am reading William Shaw’s SHE’S LEAVING HOME, his first about Sgt. Paddy Breen, trying to avoid disgrace of abandoning a fellow cop in danger by solving the murder of a young woman near the Abbey Road studios of The Beatles in 1968 London. So far, I’m enjoying both. I stuck with the Resnick, and didn’t try any of Harvey’s other series. I’d be afraid the Barry would be sad. Barbara really liked the first two Harper books and has the third on (long list) hold at the library. We’ll see how she likes it. The Shaw sounds intriguing. Speaking of music related books, I just got Murder A Go-Go, short stories based on their music. I’m wary of “translations” of short stories. Too often, the translations aren’t very good. I’ve been reading a great deal of non-fiction lately. Right now, I’m reading TEN DRUGS. Fascinating! I’m also assembling the books I’ll be taking to Ohio when we go to visit Diane’s sister for Easter. When I travel I usually take LARGE PRINT books. I think the translations are probably fine, George, I just didn’t like the stories themselves. I’m surprised you wouldn’t just take a Kindle or tablet reader. Reading A FRIEND IS A GIFT YOU GIVE YOURSELF, in which three women are on the run from the mob. Sort of Elmore Leonard light but more delicate. That sounds interesting, Patti. Are your Tulips blooming yet? They are in full glory here. I love the cover on FOREIGN BODIES but will only give it a try if my husband decides to get it. Last week, I finished reading TARNISHED ICONS by Stuart Kaminsky and THE SHORTEST WAY TO HADES by Sarah Caudwell. Now I am reading SAVE THE LAST DANCE FOR ME by Ed Gorman and MONKEY JUSTICE AND OTHER STORIES by Patti. I’m reading the Abbott too, but dipping in while reading other things. I’m completely hooked on the Posadas County mysteries right now. That’s one of my favorite series. Another is the Porfiry Rostnikov series that Tracy mentioned. I was surprised that I enjoyed Sarah Caudwell’s books as much as I did. Have you read all of them, Jeff? I just finished #7. The Caldwell are legal mysteries, yes? Not my fav.